Fsearch 3.0 iPhone app is out! 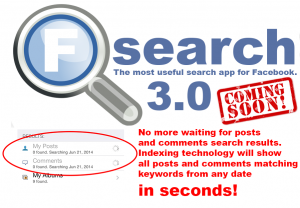 This is a massive update with a slew of new features that makes Fsearch the most comprehensive search app for Facebook! Dramatically improved the speed and accuracy of search for posts and comments by using indexing. The index data is stored on the user's device only. For more information please visit http://fsearchapp.com/indexing. Statistics on the most common words, top commenters, number of posts by month and year, number of comments by you on posts of the specific friend/page, number of comments of a specific friend/page on your posts. See all posts within a specific month and year. Searchable list of all words used in all posts. Searchable list of all people who commented on a specific friend/page's posts. See all of your comments on posts by a specific friend/page. See all comments by a specific friend/page on your posts. Please note that currently the only comments that can be searched are the ones that are posted on items on users/pages' timelines, not on photos and videos. Fsearch 3.0 iPhone app coming soon. Fsearch 3.0 iPhone app is coming soon. 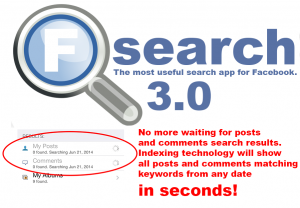 New features include: * Fast search for Facebook posts and comments. * See the most common words and top commenters. * See the number of posts by month and year. * See the posts within a specific month or year. * See the number of comments by you on posts of the specific friend/page as well as the number of comments of a specific friend/page on your posts with ability to see the actual comments in chronological order.